Drika Kadraka (45) one of the most vocal activists and leaders of Dongria Kondh Adivasis of Niyamgiri hills in their battle against the multi-national mining giant Vedanta lost his own battle and committed suicide Friday night. A few days ago he was picked up by anti-Maoist squad of Odisha from his village Ambadhuni ,Rayagada district, Odisha state, India, without any charges filed against him. Somehow, he escaped from the police and came back to the village. The whole village rallied around him and said they will go with him to the Superintendent of Police of Rayagada district with him and demand an explanation why he was picked up by the police. It appears that from the psychological trauma, he committed suicide. Yesterday morning the villagers gheroed the police station and Kadraka’s wife has filed a case alleging police intimidation as the cause of his suicide. Odisha human rights activist Praful Samantrai said he will file a complaint to National Human Rights Commission against the growing intimidation of anti-Maoist forces against adivasis. Drika Kadraka was part of the first Dongria Kondh delegation that went to Delhi in 2007 to speak to MPs, media, Tribal Minister, activists, etc. Ever since then he had been subjected to various pressure tactics by Vedanta and Government. He had even contested Panchayat elections before the Vedanta project had entered the area. Because of his political awareness, the paramilitary, which for the last six years had been working day and night to break the resistance of the Kondh, had made him a target and on several occasions in the past beaten him badly in his own village. There have been several cases in the recent past in which innocent adivasis where killed by the anti-Maoist forces. On 15th November, three innocent villagers were killed in the encounter launched by Odisha’s elite anti-Maoist combat force Special Operation Group (SOG) in western Odisha’s Kalahandi district. Agroup of adivasis from Nisanguda village under Jugasaipatna grampanchayat of Bhawanipatna block had gone to look for the missing goats of panchayat wardmember Jay Majhi when they came under fire from the SOG. Within minutes wardmember Majhi and two others — Jaya Shankar Naik and Sukru Majhi — fell to the police bullets. Two minor boys, Arjun Majhi and Ichhu Majhi, were seriously injured in the firing. In a similar incident on July 26, Duba Nayak and his wife Budi Nayak were killed in firing by personnel of the Special Operations Group and the Central Reserve Police Force, deployed for anti-Maoist operation in Kotagarah block of Kandhamal district.Since the couple were unable to get network on their mobile phones, they had trekked the Ladima Hills to talk to their son, who was in Kerala. While talking to their son over phone, they were hit by bullets. Their son, Rahul Nayak, in his petition submitted before the State Human Rights Commission, narrated that he had heard over phone their parents screaming in pain. Next day, the villagers discovered their bullet-ridden bodies. Vedanta also known as Sesa sterlite, has invested Rs.5,000 crore to set up an alumina refinery with a capacity of one million tonnes a year at Lanjigarh in Kalahandi district of Odisha. The refinery had plans to source bauxite from the Niyamgiri hills spread over Rayagada and Kalahandi districts of Odisha. Sourcing the bauxite from places further off, would mean lesser profits for the multibillion giant and would delay their plans for further expansion, to quickly increase production from one to five million tonnes a year. This project has ambitious plans to kill the hills spread over 250 sq km and destroy the lives and livelihoods of approximately over 8,000 people who have nurtured these forests and minerals underneath this land, which is now estimated to be about 70 million tonnes of bauxite. The forest clearance for this project had been rejected following a directive of the Union Ministry of Environment and Forests in August 2010. The Odisha Mining Corporation had challenged this in the Supreme Court. Following this, the Supreme Court had ordered the state government to organise gram sabhas under the Forest Rights Act of 2006, to take a final decision on the issue based on the people’s opinion. 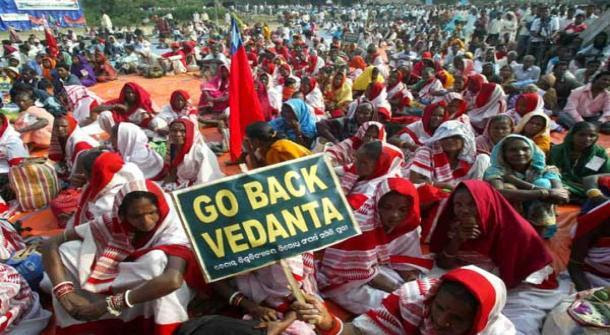 In 2013, palli sabhas (gram sabhas) were held in the beautiful hills of Niyamgiri between July and August of 2013, to decide whether the joint venture of state-run Odisha Mining Corporation and Vedanta Aluminium Ltd, should be allowed to go ahead with their bauxite mining extraction project. The district administration chose 12 of the total 112 villages that officially constitute the Niyamgiri hills for the gram sabhas, which were in the first phase of the anticipated core mining area. (Locals say there are many more small hamlets which don’t figure in the records). The palli sabhas itself, were a classic example of state intimidation, in the name of democracy. The peace loving Dongria Kondh tribal communities, who have otherwise had limited interactions with the outside world, were now asked to come and make statements in public, in the presence of armed police personnel and district administration- people who were alien symbols of power in an outside world for them, only seen at times in the forests, when they would come and intimidate them and wrongly accuse them of supporting the naxals, from time to time. The gram sabha resolutions unanimously voted against the project and vowed to protect their land and forests from vested interests. The message was loud and clear to the company and to the government. The final judgment in accordance with the law, had been made, following all due procedures. The State government had been making atrocious claims that there will be no environmental impact and that the project would benefit locals! They went as far as to say that trees can be planted after mining, and hence the protest against mining was unjustified! The company made press statements that it is the duty of the state to provide it with the required raw materials to run the refinery. The Supreme Court verdict had done nothing to change their plans thus far. Meanwhile there were reports of the state government having assured the company 150 million tonnes of bauxite. This in itself should be treated as a gross contempt of court. However, what does one do when the state turns against the interests of its own people? When corporate money talks and when the state looks for ways to overlook its own laws and court rulings to please vested corporate interests?